Item # 315535 Stash Points: 295 (?) This is the number of points you get in The Zumiez Stash for purchasing this item. Stash points are redeemable for exclusive rewards only available to Zumiez Stash members. To redeem your points check out the rewards catalog on thestash.zumiez.com. Add some moody style to your sticker collection with the Samborghini Me, Also Me Sticker. 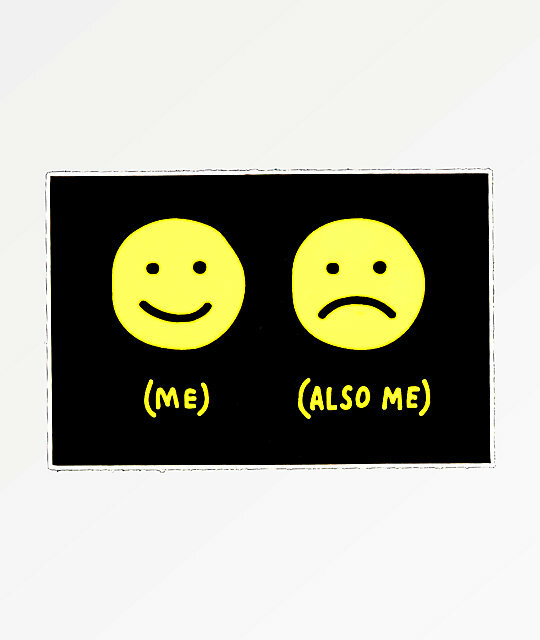 This sticker features a smile face next to a frown face graphic in classic yellow with a black background for a colorful look with tons of contrast. Me, Also Me Sticker from Samborghini. Smiling and frowning face graphic. 3" x 1.5" | 7.5cm x 3.75cm (approx. ).